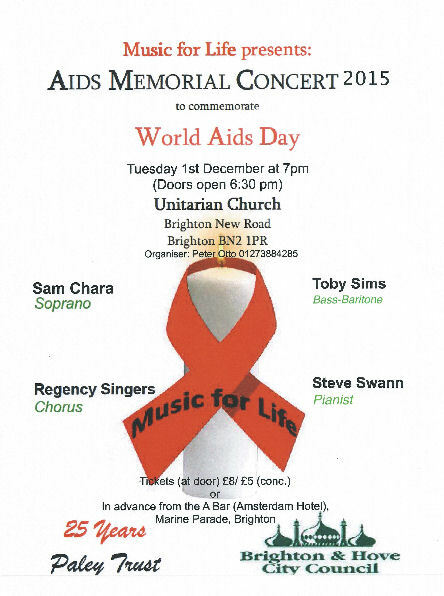 The Aids Memorial Concert 2015, performed for the first time in 2008, is supported by Brighton & Hove City Council and sponsored by the Paley Trust. The Performance on the 1st of December takes place in the presence of the Lord-Lieutenant of East Sussex Mr. Peter Field and the Mayor of Brighton & Hove Councillor Lynda Hyde . The purpose of the Concert is to celebrate the memories of friends, partners, relatives and loved ones we have lost to HIV, and to support those who suffer from this disease for which there is no cure so far. We also wish to recognize and honour the never ending task of doctors, nurses and carers who deal with this disease on a daily basis, and deserve our highest admiration.